It took me a couple of weeks before I could share my latest financial blunder with you. There is a lesson however and boy, have I learned it. My sister and her spouse invited Mr. Boomer and I join them for a week in Puerto Vallarta this October. They have rented a condo and we would only need to chip in for food and buy plane tickets. We love vacationing with them so even though we have been there many times (and this was not a planned vacation) we happily accepted. I had mentioned my vacation to my boss and team members and had it on my calendar. A few weeks I noticed ticket prices were going up and decided to buy even though now each one was almost $200 more than originally priced when we accepted. We didn’t want to cancel our plans. Since the trip had been planned a few months I couldn’t remember if I submitted my written vacation request and checked in with my boss. I had not. Even worse, my team mate will be gone at the same time on a long-planned two week trip. He hadn’t submitted the vacation request yet either but I couldn’t trump his trip which was planned long before mine. I bought the tickets hastily because they were going up and can reuse them but only after paying a $150 change fee per ticket. Sure, we can use them for a planned trip next year but who knows if the value will even cover the new ticket after this change fee subtraction. There are really two things I was reminded of by this experience. The first is not to rush into buying high cost items. It might have ended up costing me more, but I doubt it would have been $300 more. Second, make sure you take care of the details. If I had submitted my request I would have learned about the conflict sooner. I am such a planner that I try not to burden my boss with requests so far in advance. That backfired! We’re already planning next year’s vacation since it will involve several family members. I better get that request in! What’s your latest money blunder? Mine wasn’t tied to work, but I booked our trip for the wrong week and was forced to pay $300 to change our tickets to the right week! Now you have a checklist to follow: Time off, book vacation! Money Beagle, thanks for linking to that story, you were harder on yourself than I was (at least in print). Yes, I do have a checklist now. Plus I never want to repeat the experience of confessing this mistake. I’m sure there will be others! 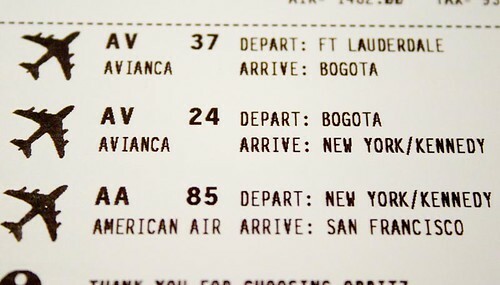 I did a post on “how to get cheap airfare” if you’re interested in checking it out. Yes I did buy the tickets online and should have known about those cookies! Thanks for linking to your post for great tips! One of my most money blunders was not using a gift card as soon as I got it. For my birthday one year, a generous family member gave me a $100 gift card. I waited so long to use it that by the time I actually used it, it had incurred $50 in fees. Ouch! I will never make that mistake again! Thank you for sharing your money mistake! Hopefully people will learn from it and not make the mistake themselves! Ashley, I think those fees are ridiculous! I make lots of blunders and I think it’s important for people to know it’s normal to make mistakes AND that I’m just as fallible as the next person. I totally agree! I don’t think companies should be able to deduct money from a gift card just because you don’t use it right away. Seems a little like a scam to me. Russian Girl, you’re right. When making a pricey purchase like that taking my time would have saved a lot of money!